Rahbar, M., Hajia, M., Mohammadzadeh, M. (2012). Urinary Tract Infections Caused By Group B Streptococcus in Adult Women: Survey of 11800 Urine Culture Results. Iranian Journal of Pathology, 7(1), 32-37. Mohammad Rahbar; Massoud Hajia; Mona Mohammadzadeh. "Urinary Tract Infections Caused By Group B Streptococcus in Adult Women: Survey of 11800 Urine Culture Results". 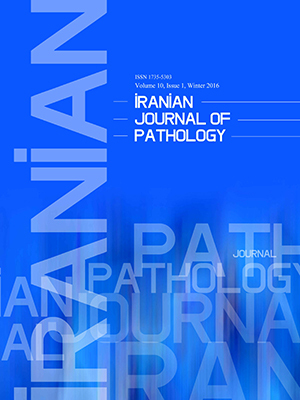 Iranian Journal of Pathology, 7, 1, 2012, 32-37. Rahbar, M., Hajia, M., Mohammadzadeh, M. (2012). 'Urinary Tract Infections Caused By Group B Streptococcus in Adult Women: Survey of 11800 Urine Culture Results', Iranian Journal of Pathology, 7(1), pp. 32-37. Rahbar, M., Hajia, M., Mohammadzadeh, M. Urinary Tract Infections Caused By Group B Streptococcus in Adult Women: Survey of 11800 Urine Culture Results. Iranian Journal of Pathology, 2012; 7(1): 32-37. Background and Objective: Early diagnosis of Streptococcus agalactiae remains difficult, since symptoms are very nonspecific. Its frequency has not been completely investigated in urinary tract pathogen of pregnant ant and non pregnant women in Iran. The aim of this study was determining the frequency of Group B Streptococci in female patients. Materials and Methods: A Total of 11800 urine specimens were received from female out-patients admitted during June till December 2010. Group B Streptococci isolates were confirmed by typical colony morphology, and identified by differential tests as well as by the growth characteristics in chromoagar. A provisional urinary tract infection diagnosis was defined by the presence of single group B Streptococci (>10 CFU/liter) with at least one of urinary tract infection symptom. Susceptibility testing was carried out by disk diffusion method. Results: Of all specimens 498 specimens (4.22%) yielded significant bacteriuria caused by group B Streptococci. The mean age of these patients were 26.6 + 19.37. Pregnant patients were 3.82% and the rest were non-pregnant. Antibiotic susceptibility test revealed that vancomycin, clindamycin and cefazolin had the lowest and penicillin showed the highest resistant rate. Conclusion: Pattern onantibiotic susceptibility test showed high resistant rate to some antibiotic that made it difficult for pregnant patients, although its frequency was low. It was not possible to compare the antibiotic susceptibility pattern of pregnant women with non-pregnant because of the low number of pregnant women registered in this study. Ulett KB, Benjamin WH, Jr Zhuo F, Xiao M, Kong F, Gilbert GL, ‘et al’. Diversity of group B streptococcus serotypes causing urinary tract infection in adults. J Clin Microbiol. 2009; 47(7):2055-60. Akhlaghi F, Hamedi A, Naderi-Nasab M. Comparison of Group B Streptococcal Colonization in the Pregnant. Acta Medica Iranica 2009;47(2):103-8. Abdollahi A, Moradi-Tabriz H, Mehdipour-Aghabagher B. Group B Streptococcal Sepsis in a Newborn: a Case Report. Iran J Pathol 2011;6(3):139-42. Al BenwanK, Al-Sweih N, Rotimi VO. Etiology and Antibiotic Susceptibility Patterns of Community- and Hospital-Acquired Urinary Tract Infections in a General Hospital in Kuwait. Int. J. Kuwait Uni. Helth Center. 2010; 19(6): 440-446. Falagas ME, Rosmarakis ES, Avramopoulos I, Vakalis N. Streptococcus agalactiae infections in non-pregnant adults: single center experience of a growing clinical problem. Med Sci Monit 2006;12(11):447-51. Farely MM. Group B streptococcal disease in non-pregnant adults. CID 2001;33:556-61. Foxman B, Gillespie B, Manning SD, Howard LJ, Tallman P, Zhang L, et al. Incidence and duration of group B Streptococcus by serotype among male and female college students living in a single dormitory. Am J Epidemiol 2006;15;163(6):544-51. 8. Edwards MS, Rench MA, Palazzi DL, Baker CJ. Group B streptococcal colonization and serotype-specific immunity in healthy elderly persons. Clin Infect Dis 2005;40(3):352-7. 9. Falagas ME, Rosmarakis ES, Avramopoulos I, Vakalis N. Streptococcus agalactiae infections in non-pregnant adults: single center experience of a growing clinical problem. Med Sci Monit 2006; 12(11):447-51. Bliss SJ, Manning SD, Tallman P, Baker CJ, Pearlman MD, Marrs CF, Foxman B. Group B Streptococcus colonization in male and nonpregnant female university students: a cross-sectional prevalence study. Clin. Infect Dis 2002;34(2):184-90. Toumi A, Ferjani A, Ben Abdallah H, Boukadida J. Streptococcus agalactiae in nonpregnant adults. Tunis Med 2006;84(3):161-4. 12- Nolla, JM, Gómez-Vaquero C, Corbella X, Ordóñez S, García-Gómez C , Pérez A, et al. Group B Streptococcus (Streptococcus agalactiae) Pyogenic arthritis in nonpregnant adults. Medicine 2003;82(2):119-128. Mandell GL, Bennett JE, Dolin R. The Clinician and the Microbiology laboratory. Principles and Practicee disease of infectious Disease. 5th ed. New York:Churchill Livingstone;2000. CLSI. Performance Standards for Antimicrobial Susceptibility Testing. Clinical and Laboratory Standards Institute. M100-S16. 2006, Wuane. USA. Rahba M, Hajia M, Farzanehkhah M. Activity of Nitrofurantoin against Urinary Tract Infections (UTI) Isolates of Vancomycin-Resistant Entreococci (VRE): Results of Three Years Survey in an Iranian Hospital. Iran j Pathol. 2007;2(4):171-4. 18- Bosch FJ, van Vuuren C, Joubert G.Antimicrobial resistance patterns in outpatient urinary tract infections - the constant need to revise prescribing habits. S. Afr. med. j. 2011; 101(5). Simoes JA, Alves VM, Fracalanzza SE, de Camargo RP, Mathias L, Milanez HM, ‘et al’. Phenotypical characteristics of group B streptococcus in parturients. Braz J Infect Dis 2007; 11(2):261-6. Skerk V, Skerk V, Jaksić J, Lakos AK, Matrapazovski M, Maleković G, et al. Research of urinary tract infections in family medicine physicians' offices--empiric antimicrobial therapy of urinary tract infections--Croatian experience. Coll Antropol 2009;33(2):625-31. Fu JC, Lin DP, Huang WJ, Huang CS, Yang CF. Antibiotic Susceptibility Pattern of Anovaginal Isolates of streptococcus agalactiae from Pregnant Women in Their Late Third Trimester. The Kaohsiung J Med Sci 2004;20(7):330-3. Al Sweih N, Jamal W, Rotimi VO. Spectrum and antibiotic resistance of uropathogens isolated from hospital and community patients with urinary tract infections in two large hospitals in Kuwait. Med Princ Pract 2005;14(6):401-7.